Great Britain guaranteed another Olympic medal as the women's hockey team reached their first final with a superb 3-0 win over New Zealand in Rio. Alex Danson's double and Helen Richardson-Walsh's penalty stroke mean GB will win at least silver, improving on their bronze at London 2012. 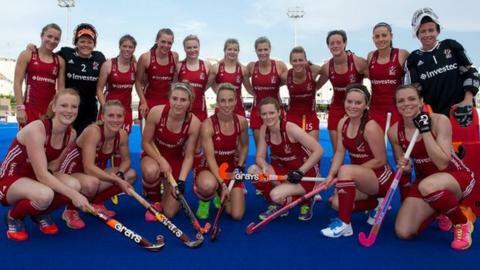 They face the Netherlands, who are aiming for a third straight Olympic gold, in Friday's final at 21:00 BST. Team GB have won 50 medals in Rio, more than at any other overseas Olympics. Argentina and Belgium reached the Olympic Games hockey final for the first time on Tuesday as defending champions Germany and fellow favourites Netherlands came up short. Argentina stunned Germany, the gold medallists in 2008 and 2012, by 5-2 while Belgium clinched a 3-1 semi-final win over neighbours Netherlands, the 1996 and 2000 champions. Australia have been knocked out at the quarter final stages of Rio 2016, going out to World #2 the Netherlands 4 – nil and ending their consecutive Olympic medal streak. The Netherlands took the early lead, scoring in the first minute of play, with Billy Bakker sneaking one in past Goalkeeper Andrew Charter with a tomahawk from the top of the circle going low into goal. After 206 minutes of play without a goal, one of the longest periods for the Australian’s, the Aussie Men have come back to break the drought and defeat Great Britain 2 – 1. The late resurgence saw all three goals come in the last ten minutes of play, making for a nail-bitingly tense game. The Australian Women’s Hockey Team found their form today, playing an absolute blinder against the London 2012 champions and coming away with the 1 – nil win over Argentina! Emily Smith scored Australia’s winning goal, and goalkeeper Rachael Lynch was on fire – successfully defending a penalty stroke that could have evened the score between the teams.